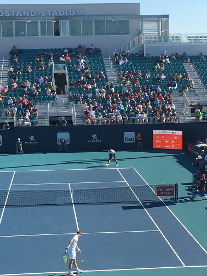 The Miami Open began in Delray Beach in 1987. It thought it found a home at Crandon Park in Key Biscayne. However, there was no more room to grow. Miami Dolphins owner Stephen Ross has stepped in and invited the tournament to move to Dolphins stadium! And what a transformation! 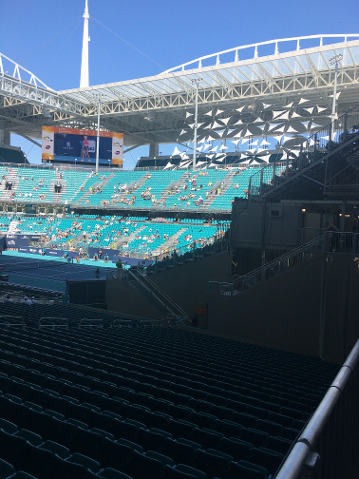 They have built a tennis stadium inside the football stadium. They have also added 30 more courts and four show courts outside in the parking lot. And, wow did they pull it off!! 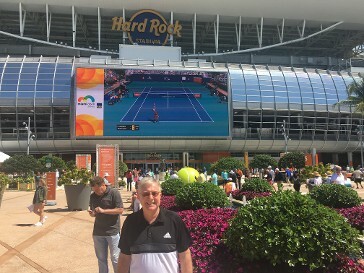 Welcome to the Miami Open! Nick Kyrios playing in the grandstand. The second show court. Here are a couple of images of the stadium. 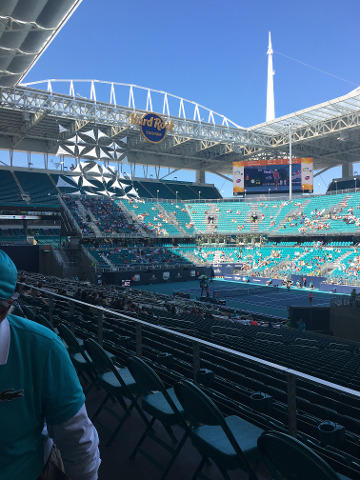 They have created a temporary stadium inside the Dolphins football stadium. The tennis stadium takes up about a quarter of the football stadium. Very unique!